Many people would rather bicycle than anything else. So Pace Sportswear designed a Live 2 Ride cycling jersey and cap for the occasion and signed Lexco to distribute the products. The Pace Sportswear Live 2 Ride jersey is made from 100% VaporTech" which makes for an extremely comfortable, hard-working jersey. Features includes: a 16" invisible zipper; elasticized waist and sleeves; and three bar-tack elasticized pockets. The jersey is offered in unisex sizing from small to XXL. An accompanying Live 2 Ride traditional cycling cap is available made of cotton twill with a KoolFit" elastic sweatband. says Karen Peterson of Lexco. 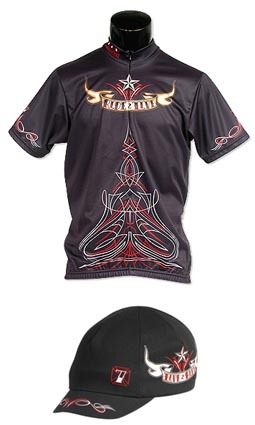 "The company's Live 2 Ride jerseys and cap celebrate the spirit of living the cycling life, and we are pleased to offer the products to our IBDs. So far the jersey and cap have been good sellers for us and we believe with summer approaching IBDs will do even better with the Live 2 Ride design." Says Maria Marsh of Pace Sportswear, "Lexco has been a loyal distributor of Pace Sportswear headwear products for many years. We are thrilled about their decision to expand the product line. Having a regional presence in the Midwest is key." Cycling gloves including "Ultimate Gel"
For more details on Pace Sportswear products distributed by Lexco call toll-free (800) 626-6556.